Uncategories District Health Society Ahmedabad has published Advertisement for below mentioned Posts 2018. District Health Society Ahmedabad has published Advertisement for below mentioned Posts 2018. 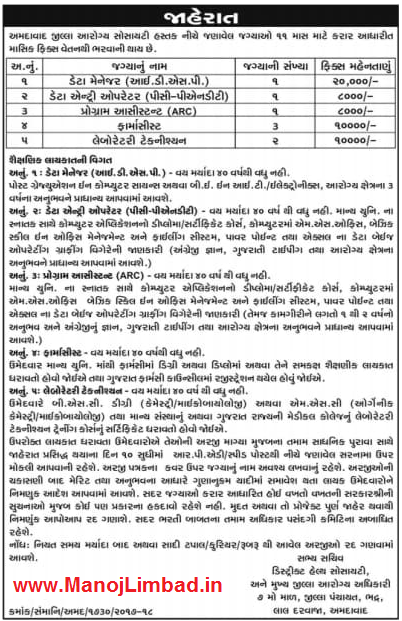 District Health Society Ahmedabad has published Advertisement for below mentioned Posts 2018. Other details like age limit, educational qualification, selection process, application fee and how to apply are given below. Data Manager: Post Graduation in Computer Science OR B.E. in IT / Electronics and 3 years experience in Health Field. Data Entry Operator and Programme Assistant: Any Graduate, Diploma/Certificate in Computer Application, Microsoft Office, Knowledge of Accounting Software & Computer Hardware, good skills in Office Management & Filling System. 1 or 2 years experience in related field. Address: District Health Society & Chief Health Officer, 7th Floor, District Panchayat, Bhadra, Lal Darwaja, Ahmedabad.